LEXINGTON — The Division II, Region VI track and field meet in Lexington has come and gone and in the end, the Galion Tigers will be sending six individuals to the 2018 State Track and Field Champsionships on Friday, June 1 and Saturday, June 2 at Jesse Owens Memorial Stadium on the campus of The Ohio State University. Headlining the state meet qualifiers is the first-ever, four-event qualifier in school history for the Lady Tigers, Kerrigan Myers. Myers punched her first ticket to Columbus on Thursday, May 24 when she cleared 5-feet, 2-inches to snag fourth in the high jump. She will be joined in the event at Owens Stadium by teammate Marisa Gwinner. Gwinner cleared the same height but with less attempts needed, took third to advance to the state finals. Next up for Myers was the 100-meter hurdles. Both Myers and Samantha Comer were in action with hopes of moving on to state and after the finals on Saturday afternoon, Kerrigan advanced with a third place finish in 14.67 seconds. Unfortunately, Comer finished in eighth place with a time of 16.54 seconds to earn a point but not advance. Myers continued her event-packed Saturday when she was joined by Jalyn Oswald, Brooklyn Cosey and Gwinner in the 4×100-meter relay. After qualifying with the second fastest time in the preliminaries held on Thursday (49.70 seconds), the Lady Tigers foursome will find themselves in action later this week after taking third place on the podium with a time of 49.64 seconds. Kerrigan finished up the clean sweep of state qualifying performances with the 200-meter dash. In Thursday’s prelims, Myers had the fourth fastest qualifying time at 26.16 seconds. On Saturday, she bested that time, crossing the finish line in 25.61 and taking third place in the field. In addition to Oswald, Cosey, Gwinner and Myers, Sari Conner and Bri Streib were also in action in day two of the regional meet over in Lexington. Conner would be running in the 800-meter run, finishing the event in 2:25.54 to earn a point and a spot on the podium in eighth place for Galion. Streib entered the discus throw with the third highest seeded distance but would leave regionals with a state berth and a runner-up finish after uncorking a throw of 135-feet, 1-inch on Saturday. For Myers, Gwinner and Streib, their state championship run will begin on Friday, June 1 at approximately 9:30 a.m. where Myers and Gwinner will be inside the stadium in the high jump and Streib across the way in the disc. Myers will then be in preliminary action for the 100-hurdles at 2 p.m. before running in the 4×100-relay alongside the other aforementioned Lady Tigers at 2:50 p.m. Myers will be part of wrapping up the day in the qualifying for the 200-meter dash at approximately 3:40 p.m.
For the Tigers’ boys team, two relay squads and one individual qualifier advanced to finals action on Saturday and joined Braxton Tate, who was running in the 3,200-meter run. Tanner Crisman, Colbey Fox, Kalib Griffin and Takoda Crisman clocked in with a time of 43.79 seconds in the 4×100-relay, qualifying for finals at fifth in the field. On Saturday, the team turned in a slightly slower time of 43.93 seconds which put them on the podium in sixth place but ended their postseason run. In the 4×400-meter relay, Gage Lackey, Takoda Crisman, Fox and Jacob Williams came together to take seventh, with a qualifying time of 3:29.51 on Thursday. Williams was substituted back into the foursome after Harrison Ivy appeared to reactivate a nagging hamstring injury in the 400-meter dash. In the finals, the boys 4×4 squad finished with a time of 3:26.14 which earned them fifth place, narrowly missing the cut to move on to the state meet. Takoda Crisman was in action in the 200-meter dash after qualifying in fifth place on Thursday was a time of 22.57 seconds. Crisman finished the event in the finals with a time of 22.43, taking fifth place in the field again. However, thanks to the extending of the field, Takoda received one of the two at-large bids and will prepare to qualify in the preliminaries at state on Friday at approximately 3:50 p.m. In the 3200, Tate would cross the finish line after the eight laps in a time of 10:00.51 to finish in sixth place overall in an absolutely stacked field at Lexington. With the state meet beginning on Friday and concluding on Saturday afternoon, final results will not be made available in print until the Wednesday, June 6 edition of the Galion Inquirer. I will be updating my Twitter (@GalionSportsGuy) from the meet on both days with results from the Galion qualifiers as well as the qualifiers from Colonel Crawford and Northmor. 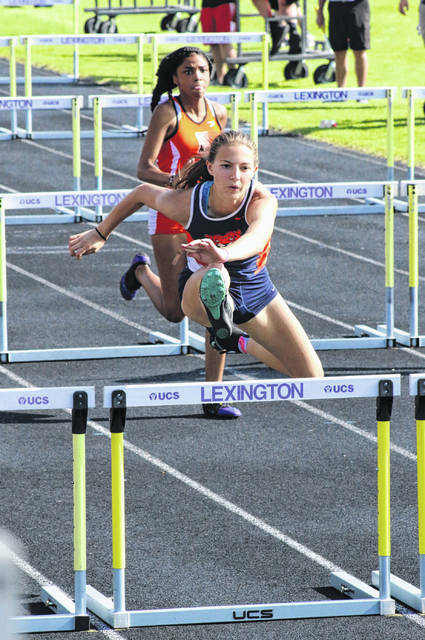 Erin Miller | Galion Inquirer After the final day of the Division II, Region VI track and field meet in Lexington, Kerrigan Myers, shown here in the 100-meter hurdles, will be representing the Galion Lady Tigers in four events at the 2018 State Track and Field Championships on Friday, June 1 and Saturday, June 2.
https://www.galioninquirer.com/wp-content/uploads/sites/38/2018/05/web1_Myers.jpgErin Miller | Galion Inquirer After the final day of the Division II, Region VI track and field meet in Lexington, Kerrigan Myers, shown here in the 100-meter hurdles, will be representing the Galion Lady Tigers in four events at the 2018 State Track and Field Championships on Friday, June 1 and Saturday, June 2.